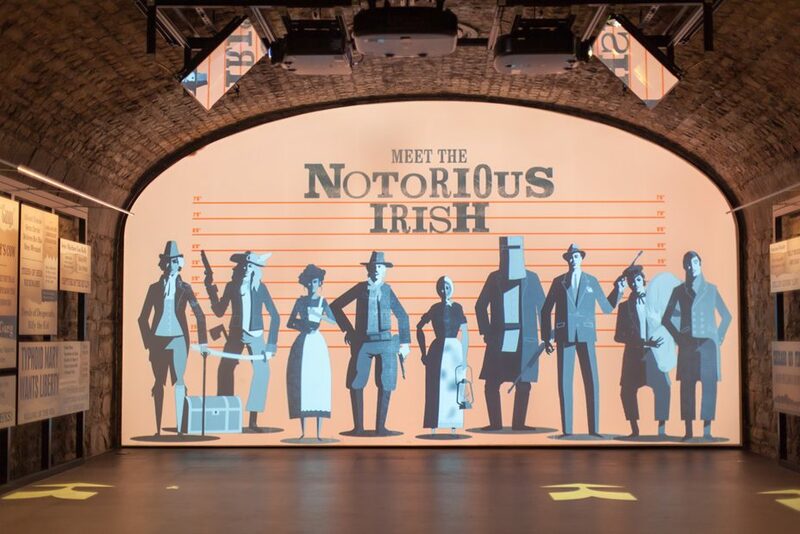 EPIC The Irish Emigration Museum is billed as the world’s first purely digital museum. 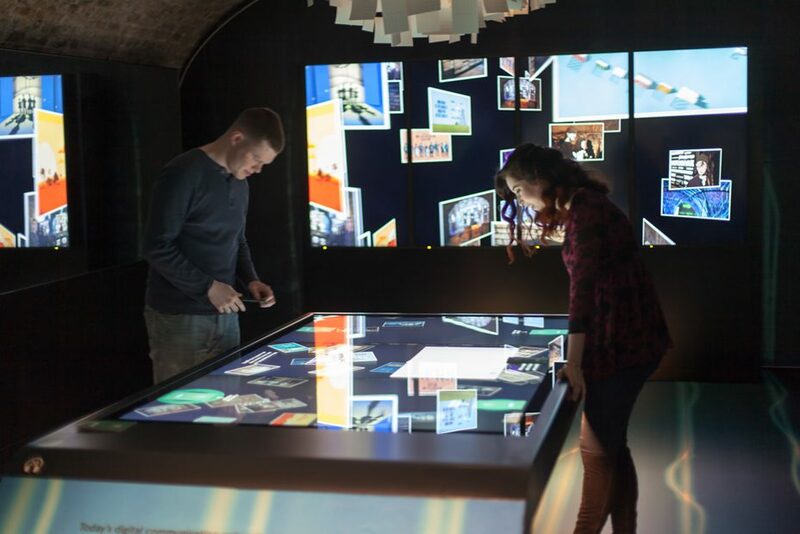 Situated on Dublin’s Custom House Quay, the museum’s exhibits are primarily delivered through interactive media and immersive installations. 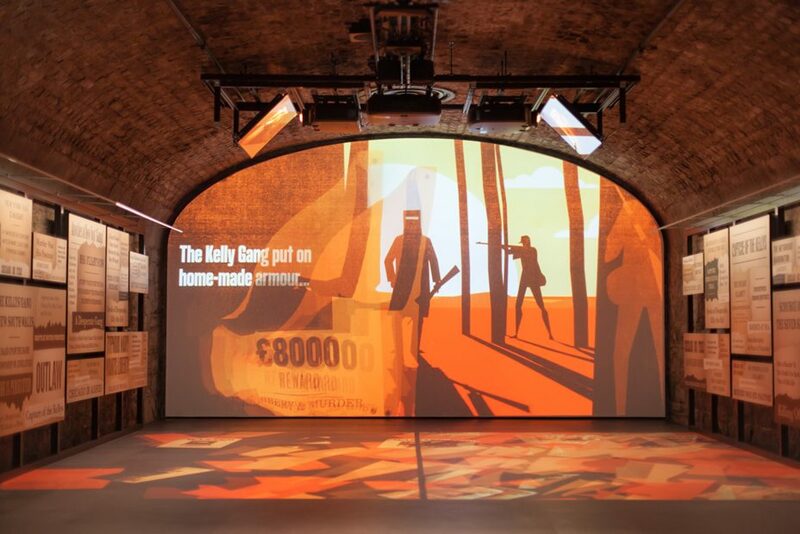 Visitors journey through the impressive vaults of The chq Building in Dublin’s Docklands, the original departure point for so many of Ireland’s emigrants. Visitors begin their journey by receiving a souvenir passport as they enter the exhibition. They can use these to ‘check out’ of each gallery they explore. There are twenty themed galleries where visitors can immerse themselves in remarkable tales of sacrifice, endurance, heritage, adventure and discovery. This interactive tracks a visitor's full body with infrared cameras, combined with projections on the floor and end wall. There are famous mysteries and crimes to solve through a series of clues and profiles of suspects, including Billy the Kid. A group of characters stand in idle mode at a scale of 1:1 until visitors approach. The characters react and plead their innocence when visitors are in close proximity. 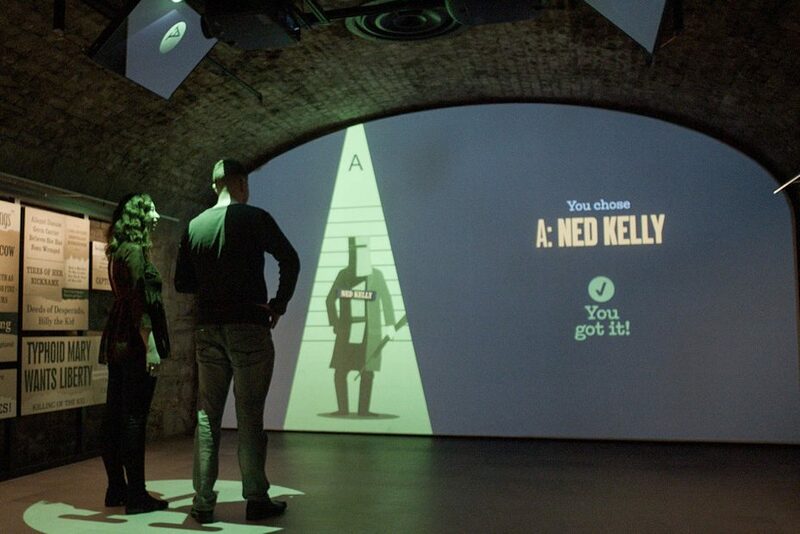 Walking along the line up, users can select a character and are offered clues to determine their innocence. Once the verdict is revealed, animations outline the main events in the characters' lives and act as a chance to debunk myths. 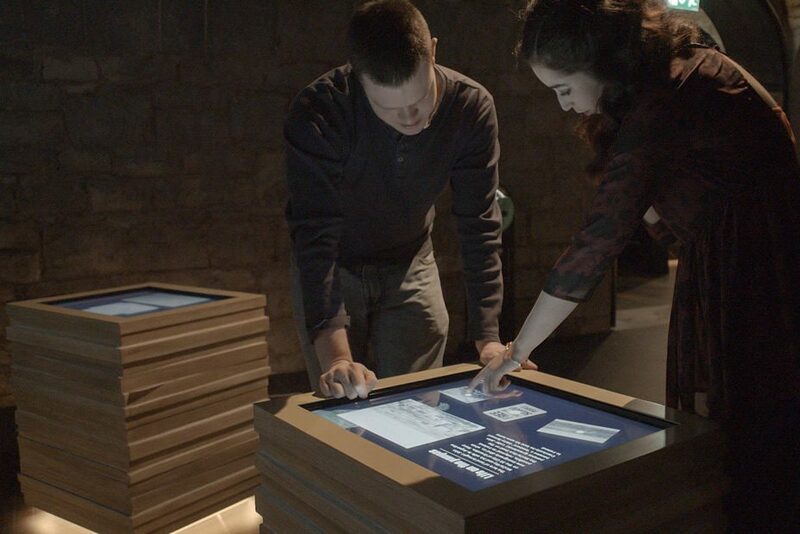 Two large interactive tables show that many Irish emigrants chose to leave for theatres of war. 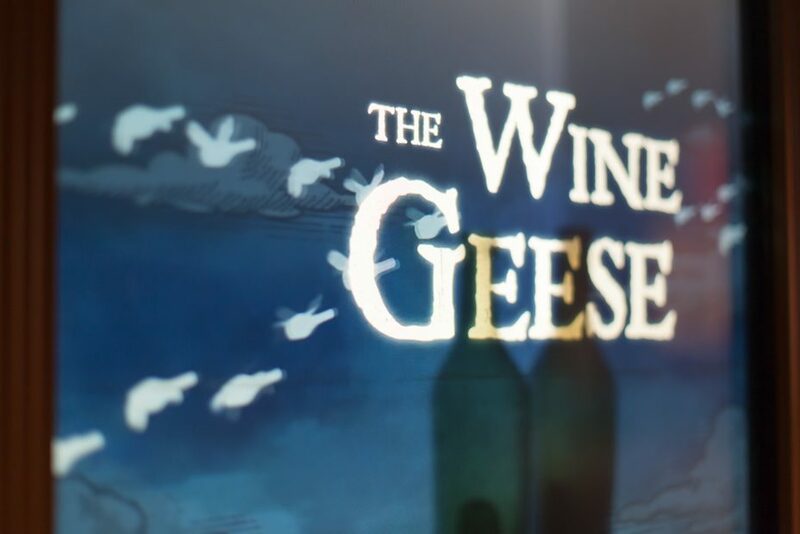 The first table focuses on the ‘Wild Geese’ period from c. 1600-1800 when Irish men were principally fighting for the armies of Europe – particularly in Catholic countries. 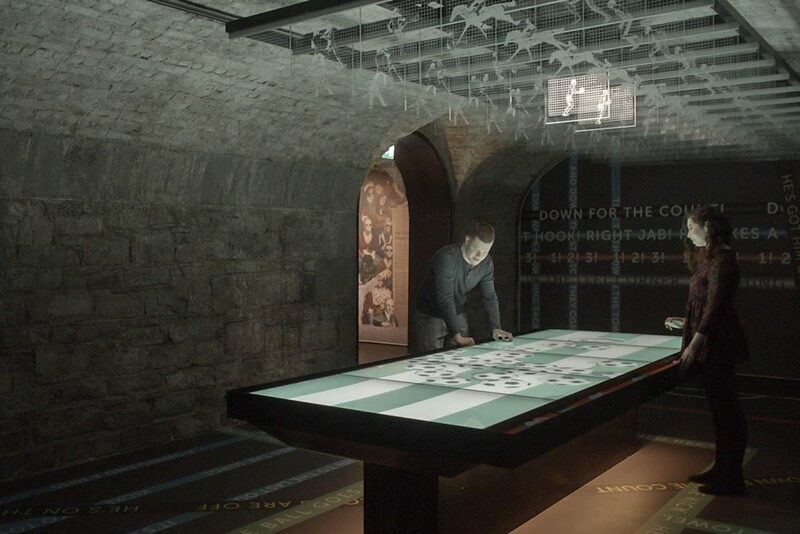 The second interactive table carries the story forward into the 19th and 20th centuries where Irish soldiers fought in the Americas and for the British Army across the Empire. The interactive design uses an innovative interface of woven ribbons which display a series of quotes and poetic excerpts. 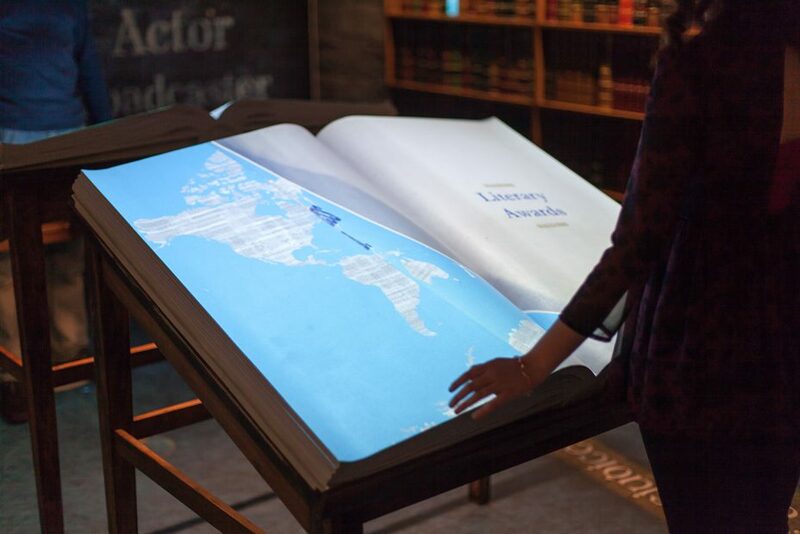 Appearing as a stack of books with a non-touch interface, this set of two interactives enables users to make their selections out of thin air. 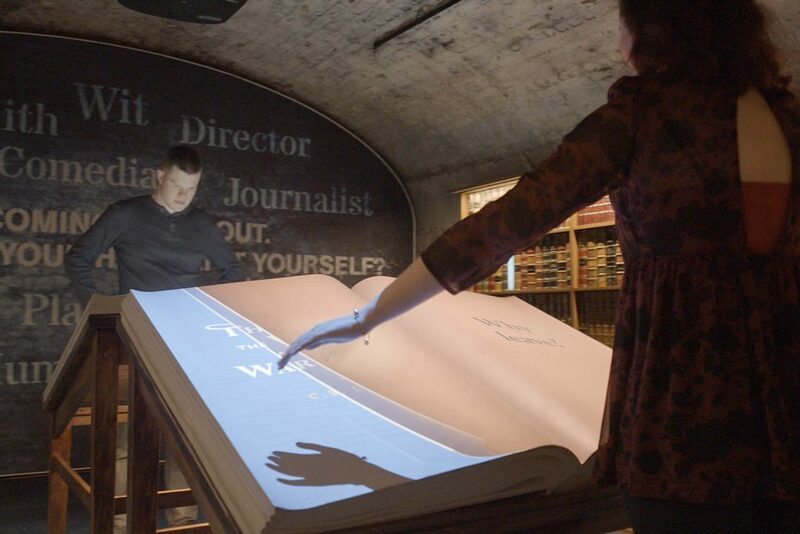 The exhibit explores the contribution Irish writers have made to world literature. Over thirty writers are grouped thematically to make it simple and intuitive for visitors to browse. 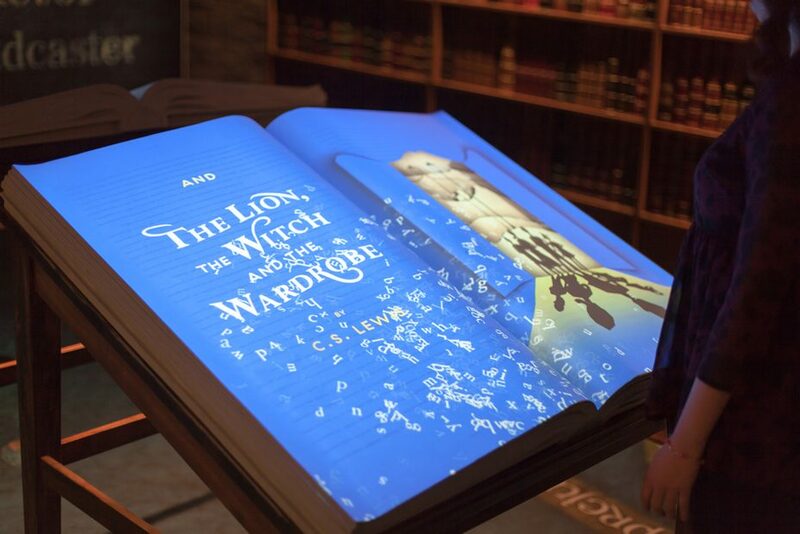 The themes are brought to life with animations, including books which 'flock' across the screens to show how authors emigrated, bleeding pages for Stoker's Dracula and redacted, shredded and burned pages for banned books. 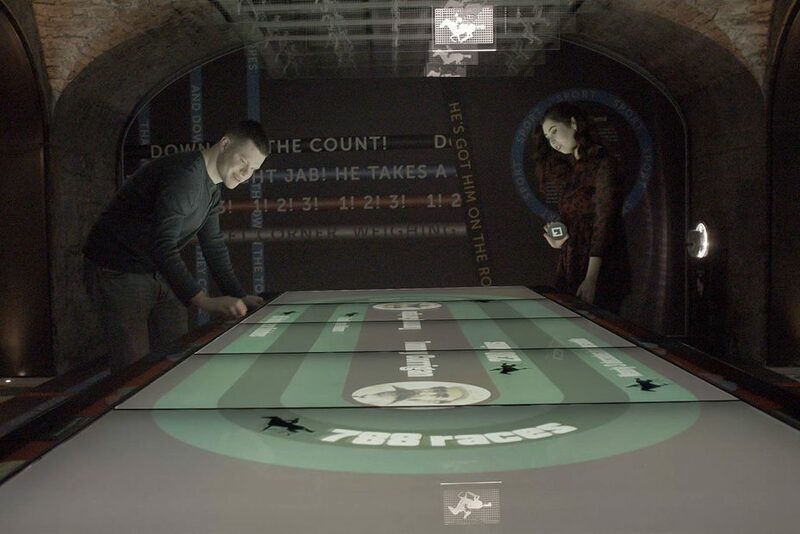 Ireland’s famous sports stars are showcased in a MultiTaction table which enables up to six visitors to interact with media dynamically presented via discs. These coloured discs link to different sports stars where each disc holds a unique fiducial graphic marker (similar to a QR code), so the system recognises which one has been selected. 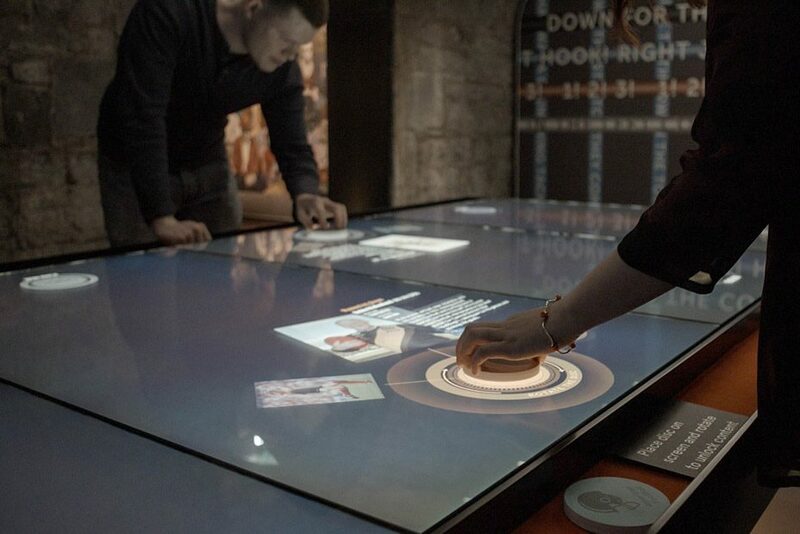 Visitors place the discs on the screen to unlock media which can be selected by touch, spin of the disc, zoom and moved around the table. Sports biographies are layered with digital collections of archive material, film clips and images. A series of full five-screen takeovers are intermittently triggered by specific sports people which play out data visualisation sequences around sporting excellence. 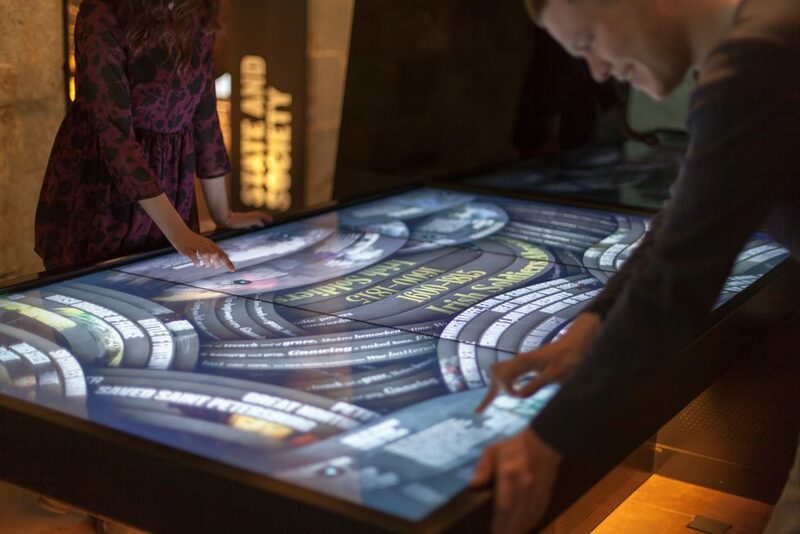 Three touchscreens are set into a series of ‘stacks’ which we treated as illuminated 'story wells' where content appears to bubble up or drop lower, reflecting the physical housing of the touchscreen. The 'Love' table introduces the concept of chain migration through exchanges between families. Visitors can sift through a pool of archived letters without formal navigation to enhance the feeling of having stumbled upon the collection, leaving them free to explore intuitively. 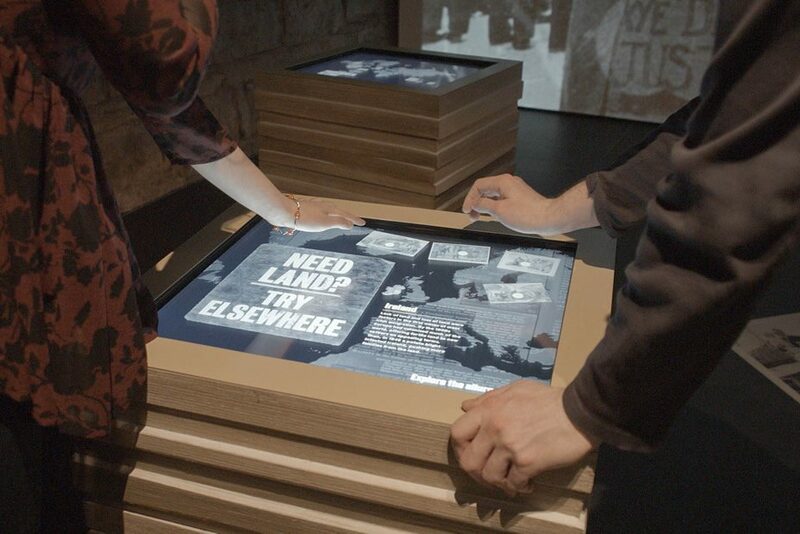 'Land' shows a map of the Irish emigration patterns where people were offered free land. 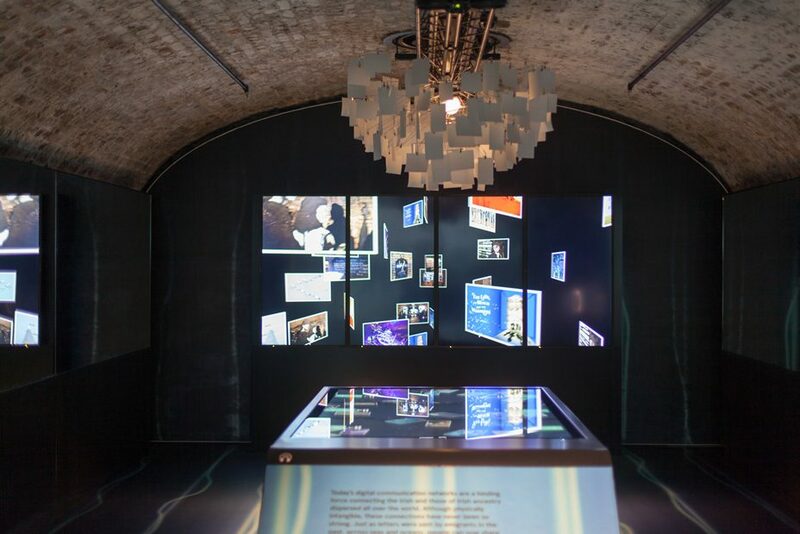 Through propaganda to potential emigrants, visitors can see how the opportunities of overseas life were sold to the Irish. The 'Labour' table is designed as a well of time, whereby users can go back in time down the well to reveal the range of jobs emigrants might have had across different eras – gold mining, fishing, farming, mining, etc. 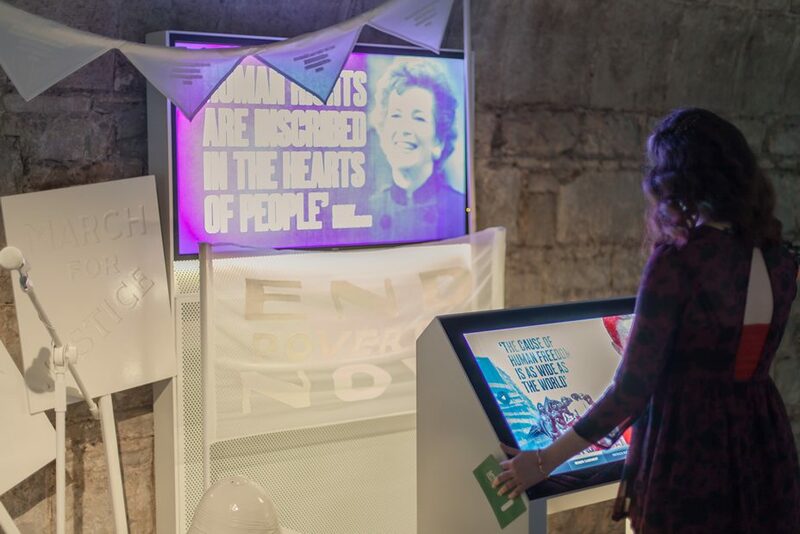 Four interactive podiums enable visitors to select from a range of key individuals involved in improving people’s rights. 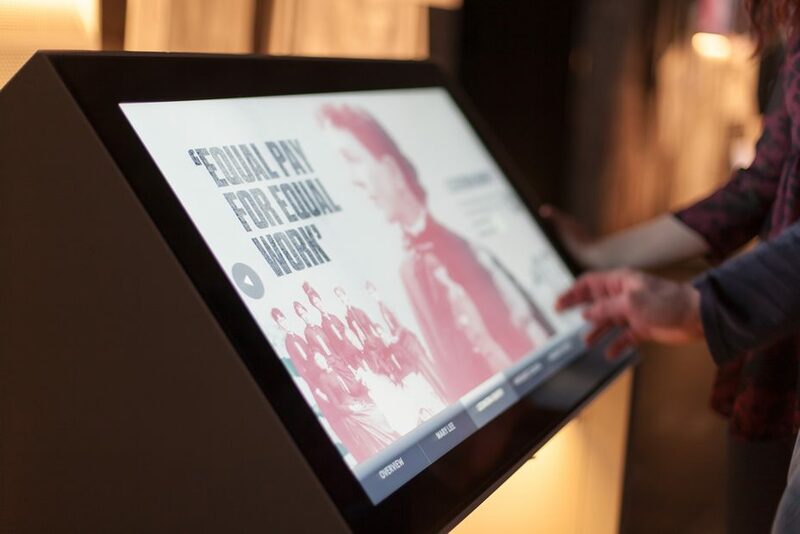 Each interactive is themed: Right to Rule, Worker’s Rights, Equal Rights and Human Rights. The same framework presents each topic as a timeline featuring individual life stories. This enables political figures to be contextualised against their peers and wider events across different political eras. The wall mounted screens provide an emotive visual backdrop and offer a bold overview of each specific theme on looped video sequences. Augmented cabinets display clear touchscreens with objects in cases behind them. As the narrative plays out, the opacity of the screen changes to reveal the object. All visitors are offered a passport when they enter the Museum which contains a unique QR code on it. 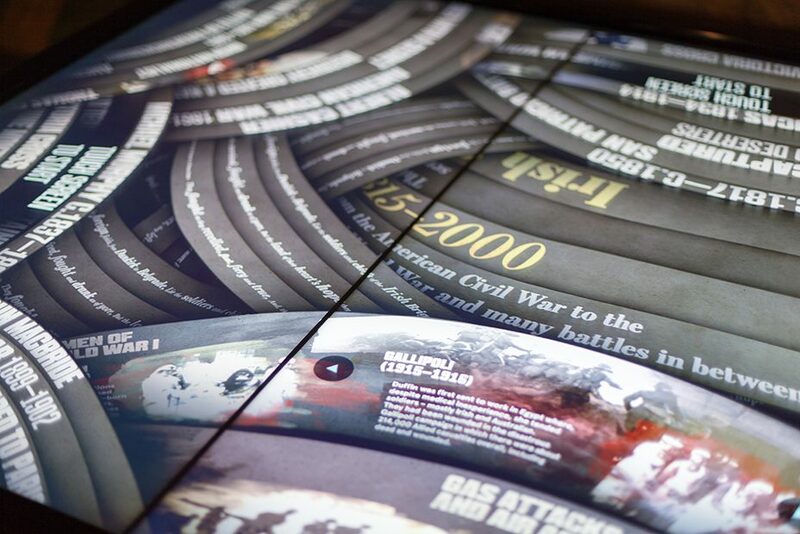 At the end of the exhibition, there is one large touchscreen and a postcard wall. Visitors can select a postcard, write a message and email it to someone. The postcard then visibly shoots across the screen towards the end wall where it appears to join the rest of the collection.